Researchers from McMaster University in Hamilton, Ont., have taken atomic-level images of individual nanoparticles during heating that could lead to improved fuel-cell technologies at lower cost, reduce dependence on imported oil and minimize greenhouse gas emissions. Heating nanoparticles and atomic-level tracking allows for the development of other less expensive catalysts, such as platinum-iron nanoparticles. Typically, pricey platinum nanoparticles are used. 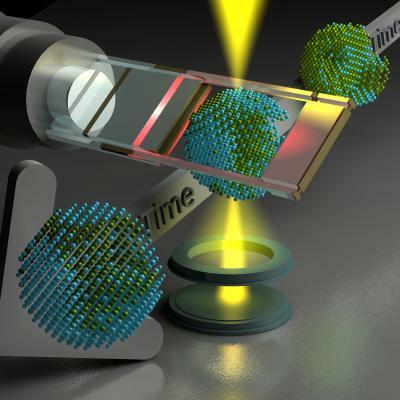 Using advanced electron microscopic techniques the team was able to track the atomic-rearrangement process of an individual Platinum-Iron nanoparticle – as it got annealed inside the microscope. "Our work is pioneering in the application of advanced electron microscopy techniques to study the structural and compositional transformation of individual nanometer-sized particles during heating," said Gianluigi Botton, Professor of Materials Science and Engineering at McMaster University. The researchers' work on nanoparticles, which are as small as 1/50,000th of the diameter of a human hair, could have far-reaching impact on the automotive industry. With the depletion of fossil fuel reserves, there has been a surge of interest in developing alternative energy sources, particularly in the area of fuel cell technology. Fuel cell devices can power vehicles by converting chemical energy into electrical energy in a far more efficient and environmentally-friendly way than the conventional combustion technologies. However, they rely on catalysts to operate and reducing catalyst-cost is crucial for commercialization. McMaster's research team comprising of Sagar Prabhudev (Materials Science and Engineering PhD Student), Dr. Matthieu Bugnet (Post-doctoral researcher) and Botton carried out their work in collaboration with Dr. Christina Bock (NRC, Ottawa) and Dr. Guozhen Zhu (Shanghai Jiao Tong University, China). "Imagine that you placed millions of nanoparticles on a pan and started heating," said Prabhudev. "During the course of heating, you select one of the particles. And, with the help of a powerful microscope, watch the atoms move. That is the equivalent to what we have done." A Titan 80-300 cubed microscope at McMaster's Canadian Center for Electron Microscopy (CCEM) was used for the research. "In terms of capability, Titan electron microscope is similar to the Hubble Telescope. The difference is that the Titan allows us to explore atomic structure of materials, instead of stars and galaxies," said Botton, also the Scientific Director of CCEM. "This includes identifying atoms, measuring their chemical state and even probing the electrons that bind atoms together." The researchers point out that the insights obtained were previously inaccessible with traditional analytical methods. The work was carried out with financial support from NSERC (Discovery and Strategic grants), Automotive Partnership Canada (APC) (Carpe-FC grant) and McMaster University.